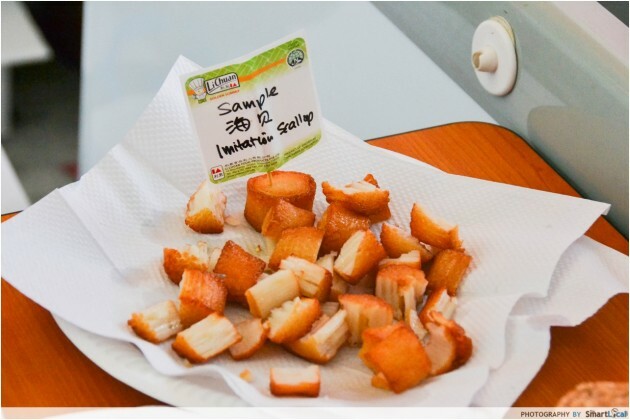 Why Shop At Supermarkets When You’ve Got Food Factories? That mint chocolate brownie you order every week at your favourite cafe? Or that lobster bisque you fork out a good $10 for? They’re being sold for one third less the price at elsewhere. Dirt-cheap Lapis Sagu is no longer a thing of the past. 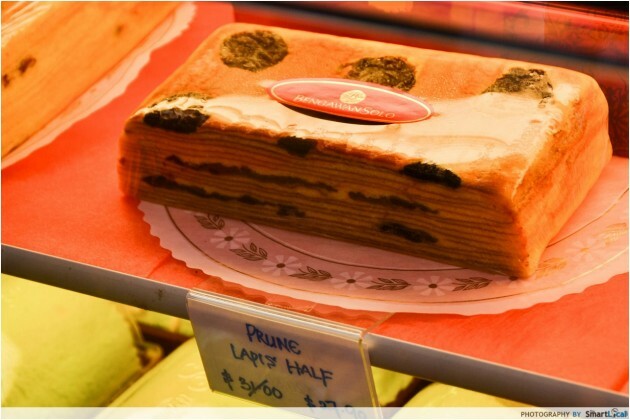 It’s still possible to find Lapis Sagu in Singapore for a mere 30 cents - if you know where to look! 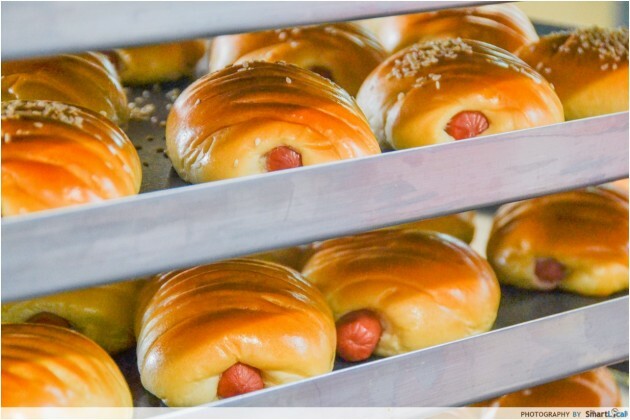 You’ve heard of factory outlets in far-off European countries selling branded goods at dirt cheap prices, but we’ve uncovered something even better - food factories that exist right here in Singapore. 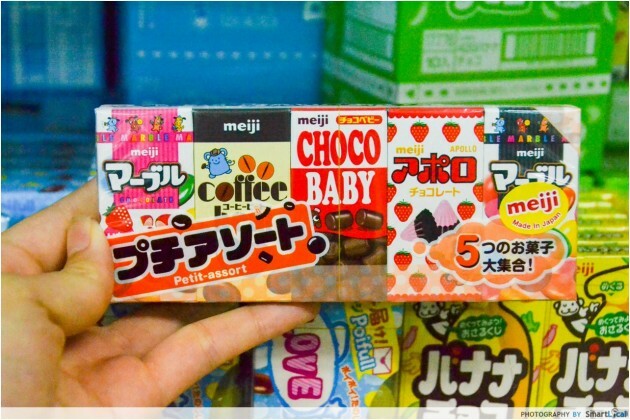 That’s right, well-known brands such as Meiji and Tai Sun are peddling their goods at wholesale prices. You’ll have to venture a little further than your normal trip to the supermarket, but don’t worry, the moolah you’ll save from shopping in industrial parks will more than offset the cost of your petrol. 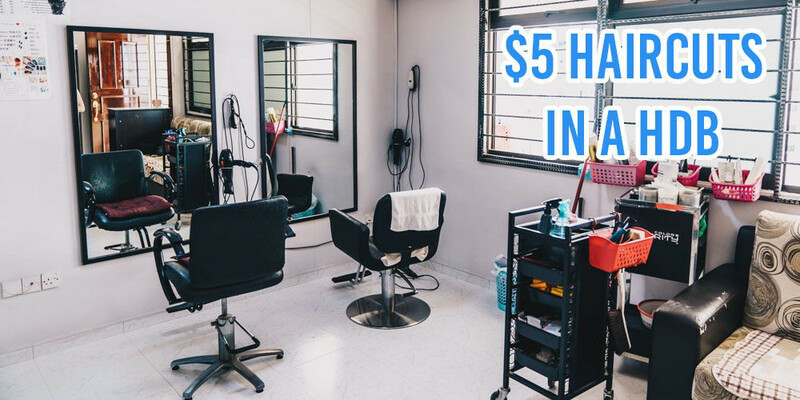 Whether you’re a cost-saving Singaporean auntie or a student on a budget, each of these unsuspecting industrial estates hold something for you. Sifting through the sea of dull and dreary-looking factories may be a bit daunting, so we’ve compiled a handy list of food factory gems that'll keep you coming back for more! 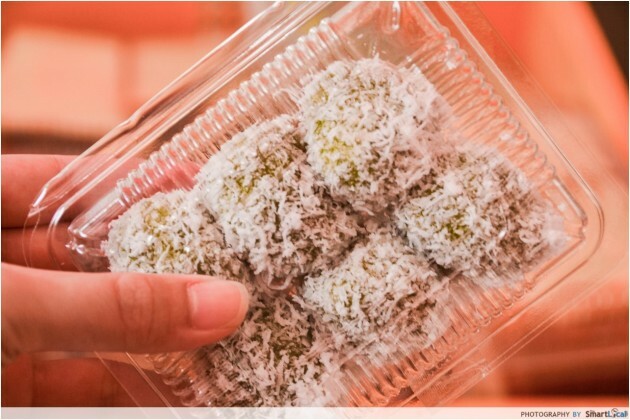 Say hello to kuehs that even your disapproving Nonya mother-in-law will give the nod to. 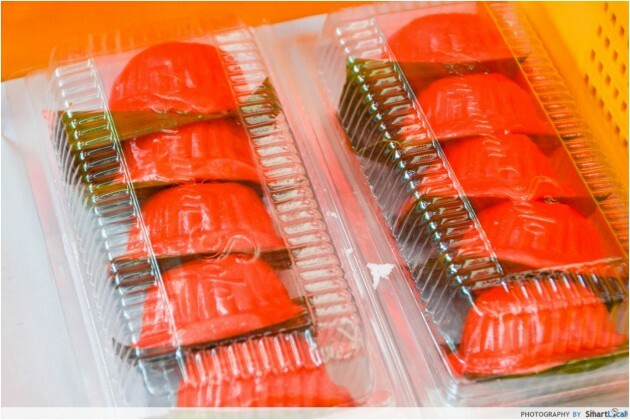 Delicious and cheap, Genting Nonya Cake and Confectionary sells a wide variety of kuehs at cut-throat prices. 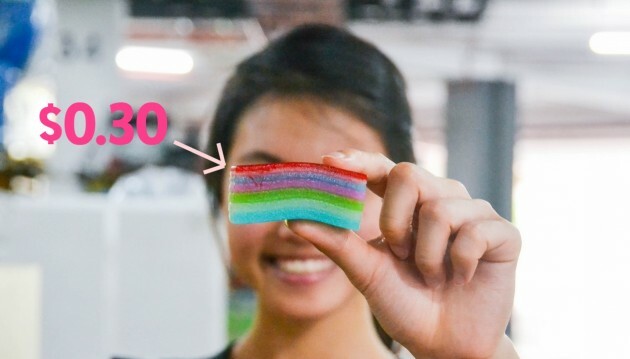 $0.30 won’t get you a packet of tissue, but here it's more than enough for a solid slice of Lapis Sagu. Strike up a rapport with the friendly uncles there, and you might even get to take home some free goodies. 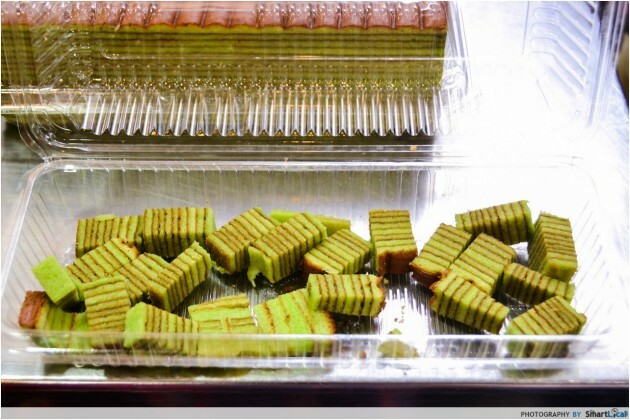 We scored a whole wobbling slab of Lapis Sagu (what everyone calls rainbow kueh) and a bag of Kueh Ambon. 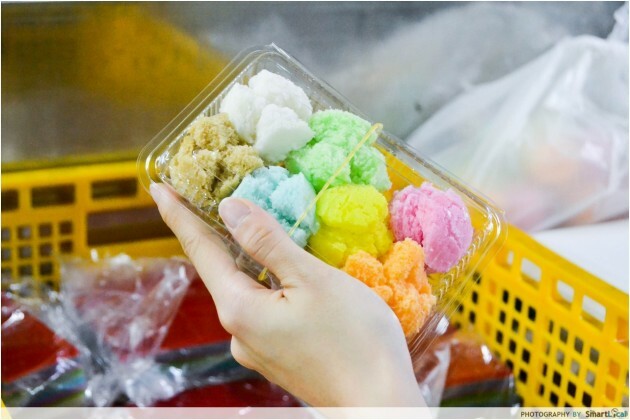 Other goodies they sell include Ma Kuo Kueh, Kueh Balu and Tapioca Kueh, amongst many others. New Everyday offers a selection of crackers and chips so extensive, you’ll be able to eat something New Everyday for 64 days in a row. 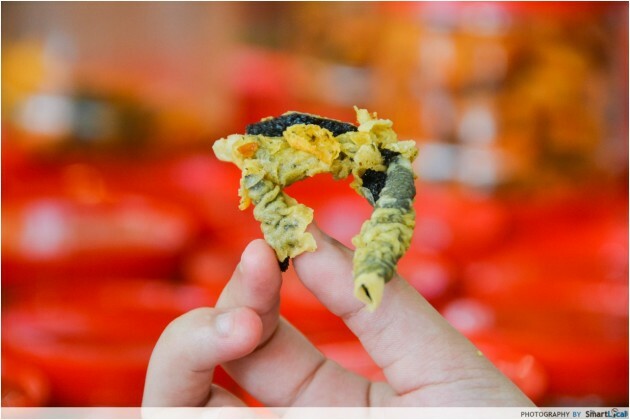 Besides the usual prawn crackers, they also sell more unconventional ones such as lobster, and beancurd crackers. For less than half the original retail price, you’ll get a big bag of crispy deep-fried crackers, great for parties and - scrap that, you don’t need an occasion to eat prawn crackers. 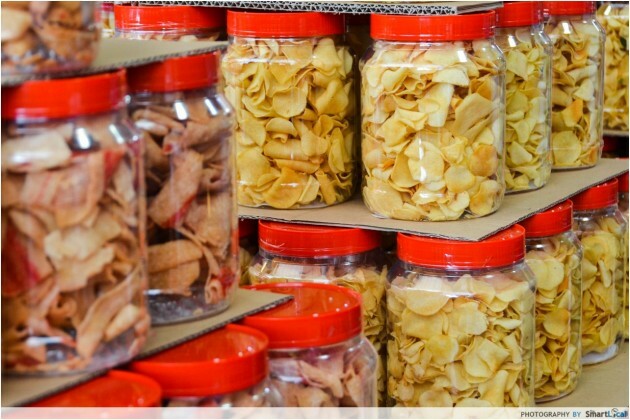 Kway Teow, Mee Pok, Vermicelli, you name it and they’ll have it. Bags of assorted noodles stacked to the high heavens, ready to be shipped off to retail outlets. 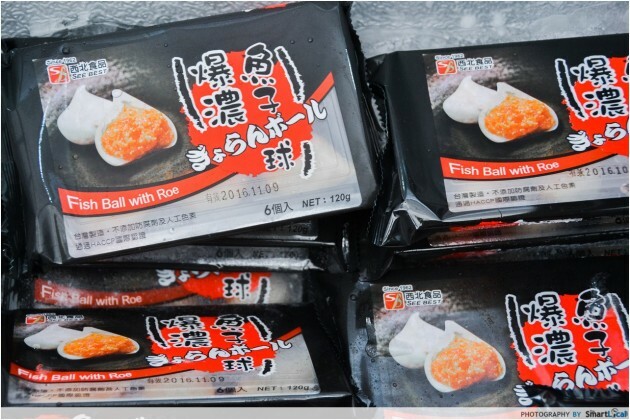 You can grab a gargantuan 3kg packet for only $6! That’s $2 per kg. Compare that to $1.50 for 400g at Cold Storage. 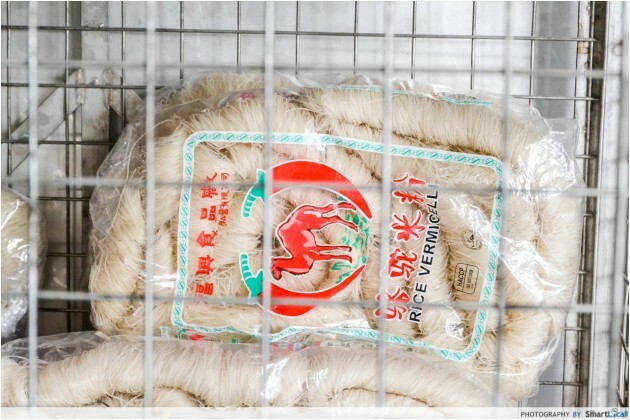 There are only 3kg packets for sale though, so be prepared to enjoy Bee Hoon for the next week or so. Or you could just store it. 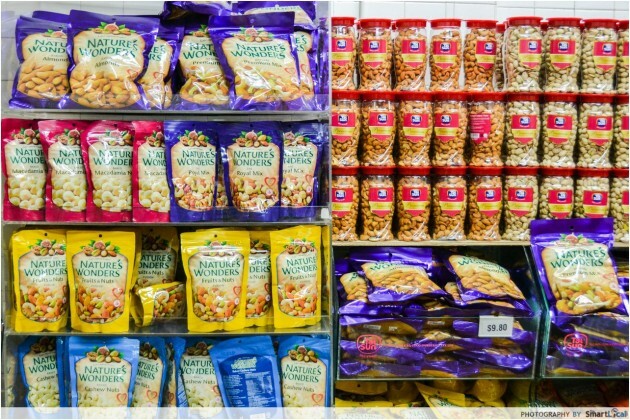 Cashew nuts, almonds, macadamia, walnuts - you name it, and Tai Sun’s factory outlet will be selling it cheaper than you’ll find at even the cheapest of supermarkets. 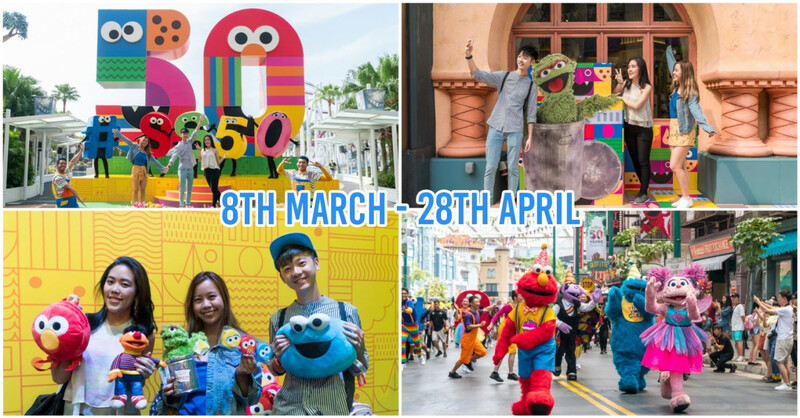 Note: Do take note that Tai Sun’s factory outlet is only open to the public one month before the festive periods of Chinese New Year and Hari Raya. 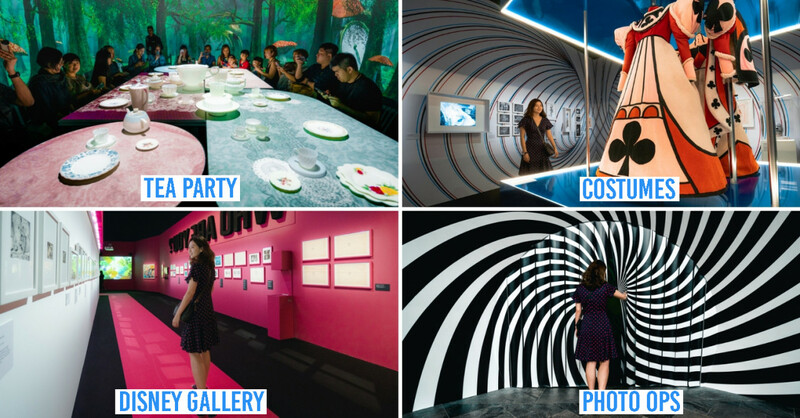 Now you know where you’ll be headed for a food rampage three weeks prior to 6th July 2016. 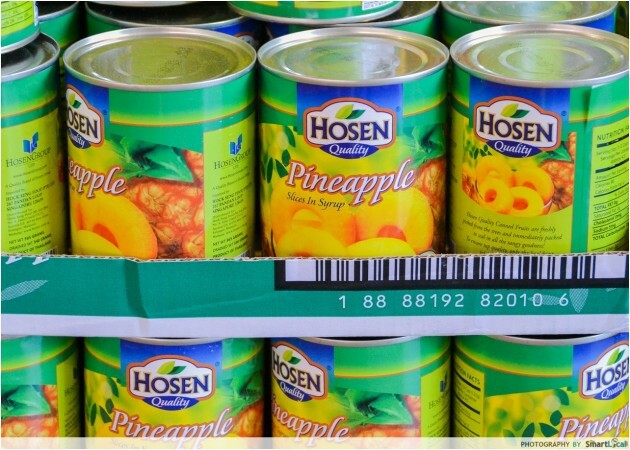 The brand, Hock Seng, is synonymous with their famous canned fruit amongst all things. 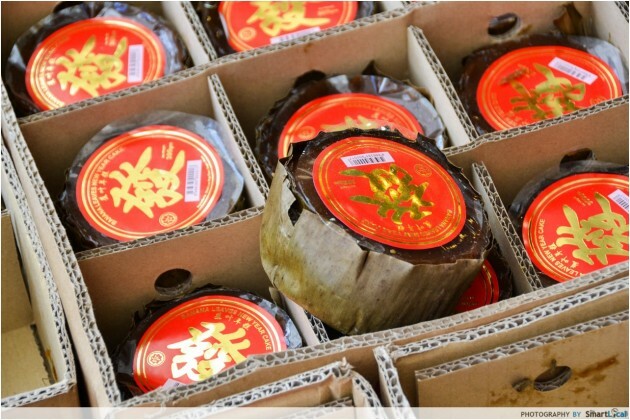 With that knowledge, I first stepped into Hock Seng’s factory expecting to see rows of canned longans, lychees and pineapples, however I was surprised to discover so much more. 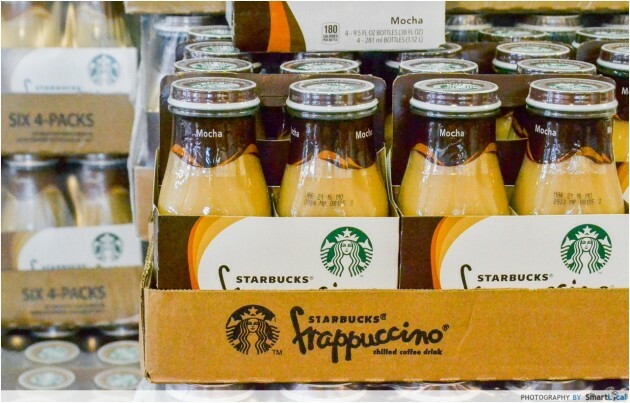 Besides the syrup-soaked fruit slices that Hock Seng is known for, there were also towering stacks of canned drinks and get this - bottles of Starbucks frappucino retailing for only 4 for $8.90. That’s $4.45 for 2 bottles - compare this to $5.60 for 2 bottles at NTUC. 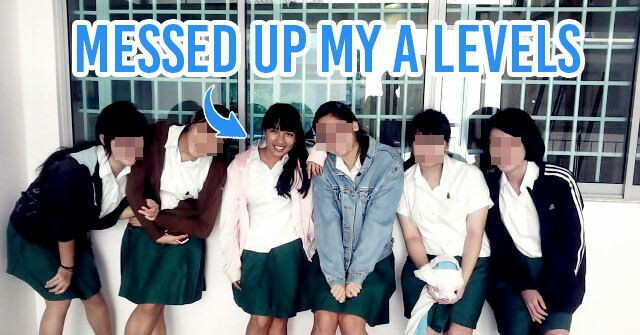 Fans of the elusive Dr Pepper drink - your never-ending search for this soft drink in Singapore is over. $9 for a pack of 12. 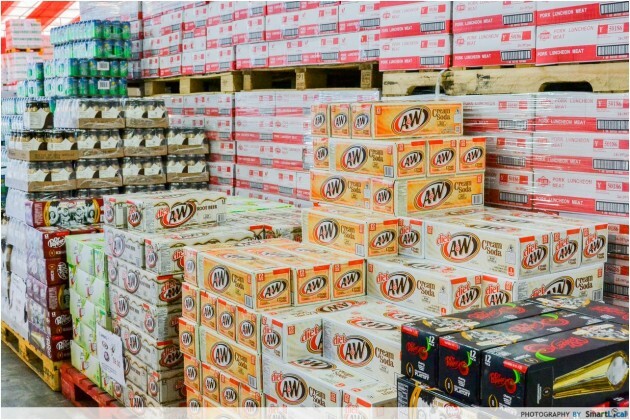 The same goes for other carbonated drinks such as A&W Root Beer and 7 UP. 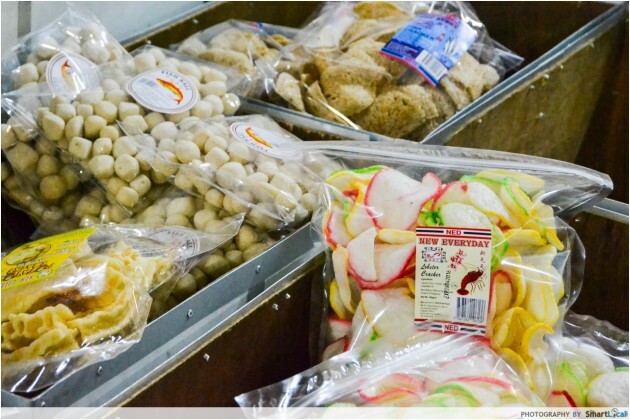 Hock Seng also stocks a wide variety of snacks - some of them never seen before in Singapore. 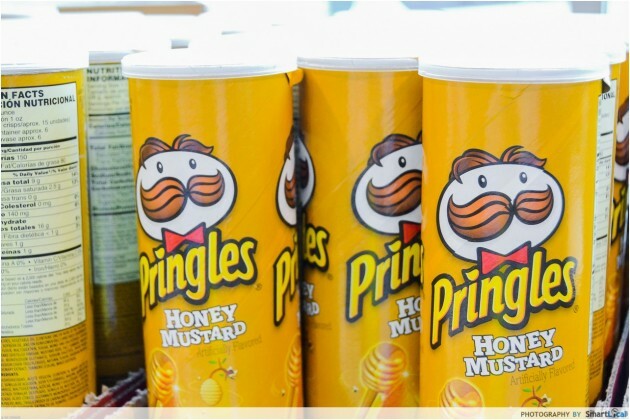 I stumbled upon rare finds such as Honey Mustard Pringles. 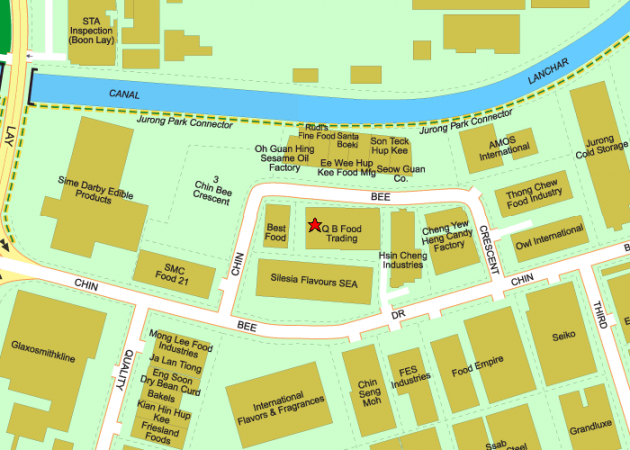 Note: Hock Seng is only open 3 weeks before Chinese New Year, so you’ll have to look forward to 28 January 2017. 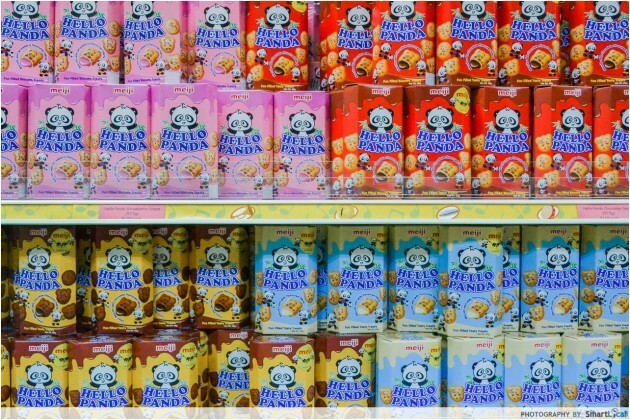 I was hit with a wave of nostalgia, when I entered Meiji’s Sweet Adventure Shop to see the shelves lined with a great number of my favourite childhood snacks such as Hello Panda and Yan Yan. The sweetness doesn’t stop there. 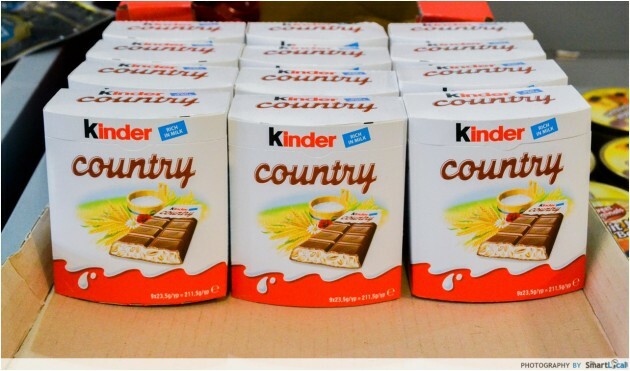 The Sweet Adventure Shop also carries snacks that are harder to get your hands on in Singapore, such as the Kinder Country, besides all-time favourites such as Choco Baby. The best thing? You get 20% off any item in the store. 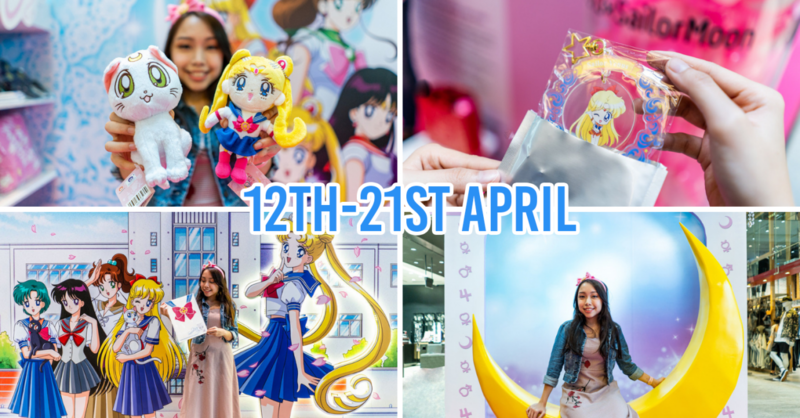 Opening Hours:: 12 pm - 3 pm every Friday, except on public holidays. This food factory requires a little more effort to enter - you can’t just walk in as and when you want. You’ll need to create an account on their website first. But once that’s out of the way, everything else is a breeze. Prior to going down, you need to order some items - even one ketchup bottle is fine - and you’ll then be given a queue number that you can use to enter the factory. Basically you just need to order at least one item online so that you’ll be given the golden ticket that permits your entry into this factory that bests even Willy Wonka’s. From pizza to cheeses to crepes, Q.B. Food Trading Pte Ltd provides quality food at discounted prices.My colleague swears by their beef steaks. For only $20, you’ll get 1 KG of Hunter Valley Australia Grass Fed Striploin. You can even specify your beef cut requirements (i.e. how thick each steak should be cut into) online! 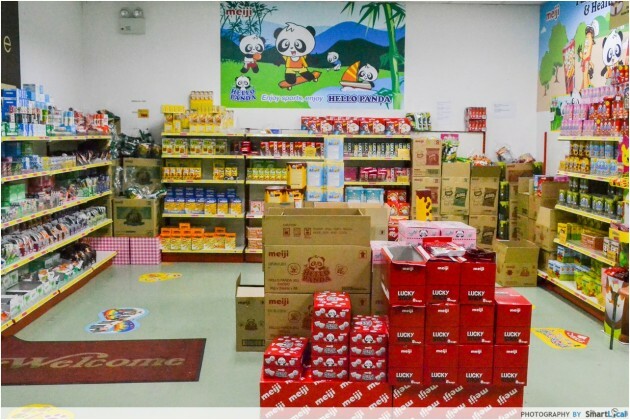 At the factory, you can collect your ordered items and also buy anything else off the shelves. If Newton’s Law of Inertia applies to you, there’s even a home delivery option! 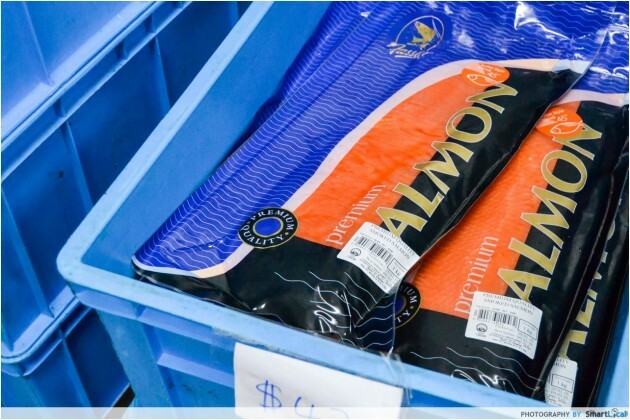 *While this may not be the best comparison because the brands are different, it gives you an idea of how the prices for Australian Striploin steak can differ vastly between supermarkets and food factories! 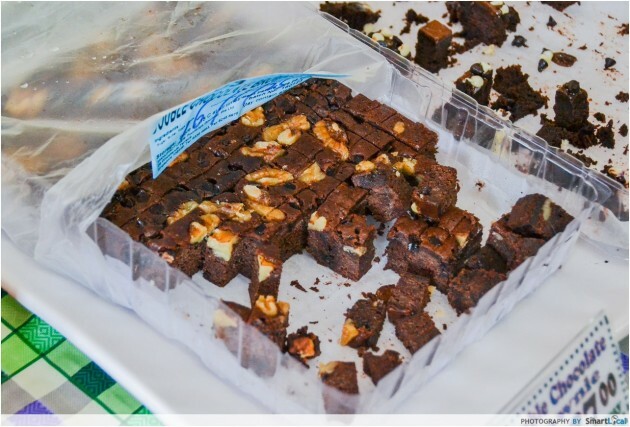 Trays of brownies, cheesecakes and crumbles lined up along a long rectangular table. It took a lot of self-control not to finish a whole tray of brownies by myself there and then. 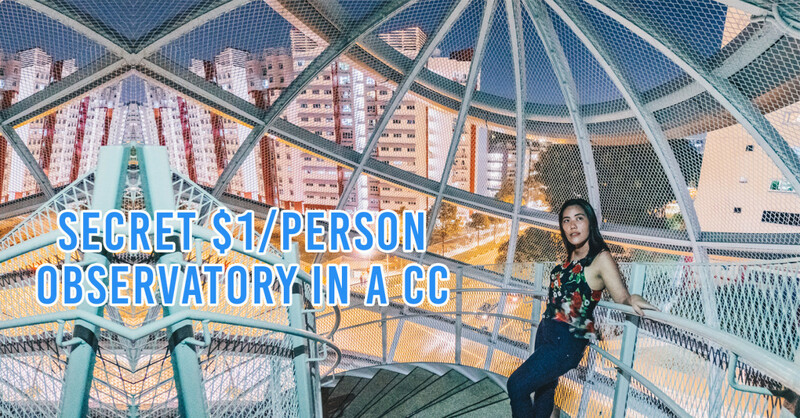 Head down to their factory at Woodlands Terrace on the last Saturday of every month and you’ll be able to face the same sweet dilemma of whether or not to be outright shameless and take your 10th piece of blueberry crumble. Don’t be surprised if their strawberry cheesecake tastes like your favourite dessert at a certain cafe you hold close to your heart. Melvados supplies to over 500 clients in Singapore, including top airlines and 5-star hotels. A personal favourite of mine is their Basil Pesto. Made from freshly ground basil leaves, grated parmesan cheese, pine nuts and olive oil, this makes a great dip for crackers, bread, salad and even pasta. Fassler - the go-to place for fresh seafood in Singapore and my personal favourite for frozen soup. Sick of that lumpy, glue-like Campbell soup? Do yourself a favour and buy a packet of frozen Fassler soup. 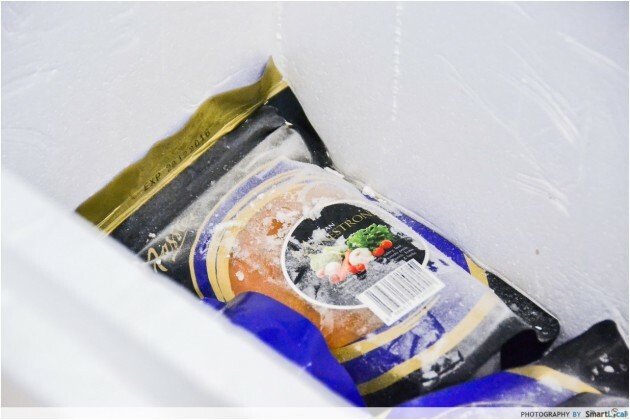 From Black Cod and Scallop Chowder to Hungarian Beef Goulash Soup, Fassler easily has the most extensive frozen soup selection in Singapore. Not to mention, these soups best even some of those served in restaurants. 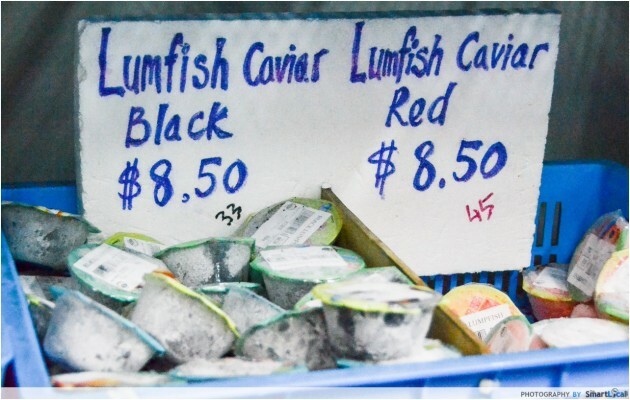 This is also where you should go for all your fresh seafood purchases. Sashimi lovers, bookmark this page, because it’s going to be your new best friend. Fassler sells pre-sliced salmon sashimi so thick and fleshy, the Japanese would be jealous. 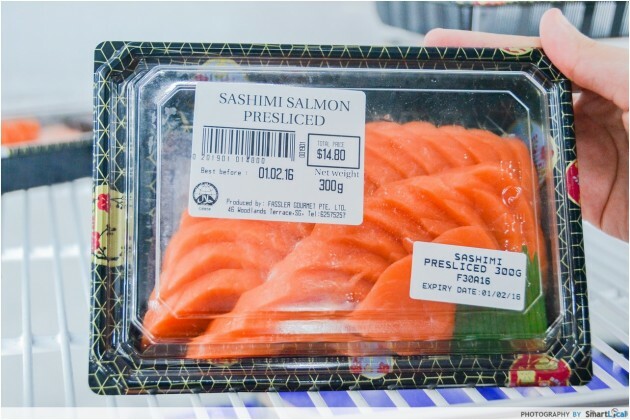 At $14.80 for 300g (approximately 34 slices), it would be a challenge to find cheaper sashimi than this in Singapore. Fassler even provides winter jackets for customers to don before they enter the freezer room. Trust me, you're going to need them. 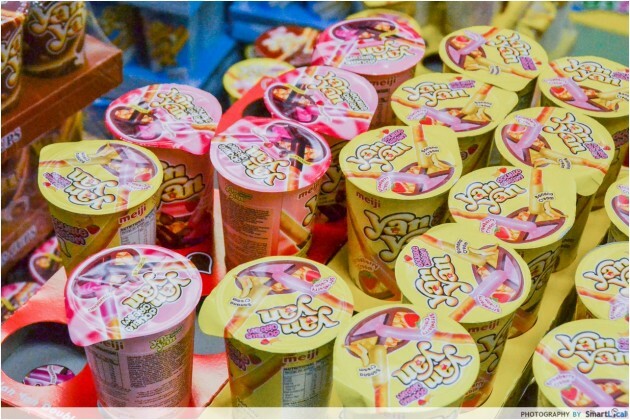 While chiku and arrowhead chips are available for sale, it's unclear whether or not they'll still be for sale once existing CNY stock sells out. 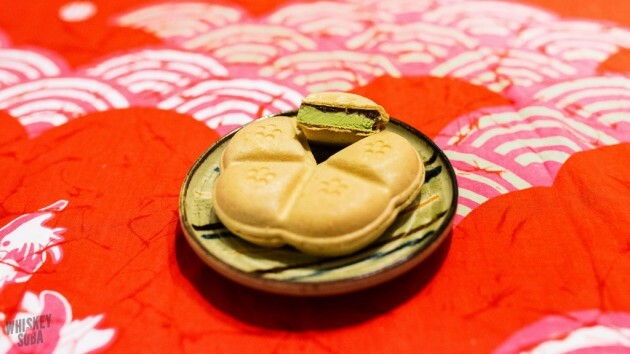 Be rest assured that this confectionery also offers a slew of other tidbits such as the notoriously difficult to find Gek Hong, and the normal fare like buns and cakes. 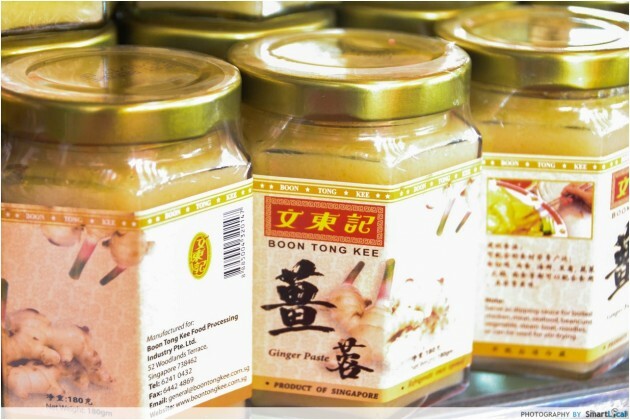 You now can attempt to recreate Boon Tong Kee’s iconic chicken rice, for Boon Tong Kee is selling their sauces such as ginger paste! 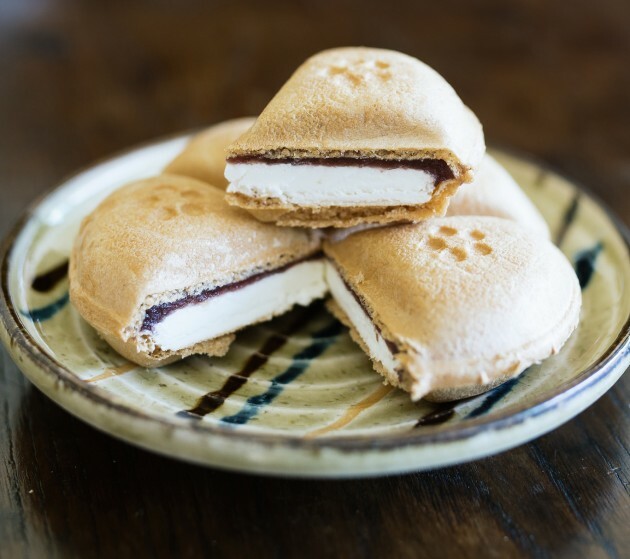 Those withdrawal symptoms from missing your favourite ice cream that’s normally only available in the Land of the Rising Sun, and far and few between in our little red dot? You’ll never have to experience them again. 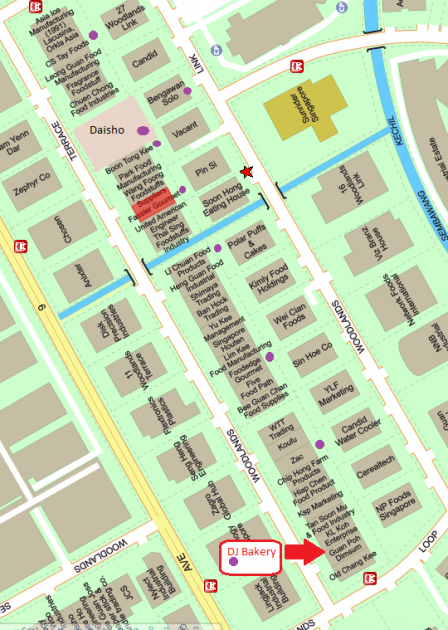 Just go to Daisho to get your fix of Japanese ice cream. 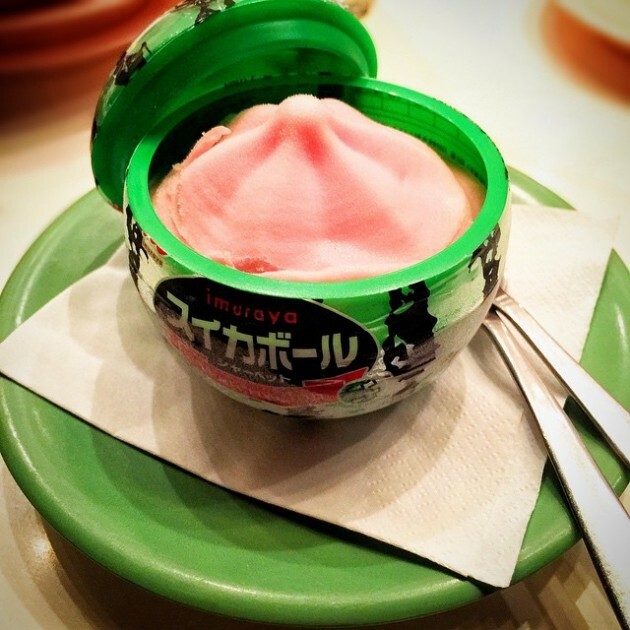 They stock many of the same ice creams that are typically found in Japanese convenience stores, such as Imuraya’s watermelon ice cream and Yawamochi. Their selection is not limited to just ice cream. 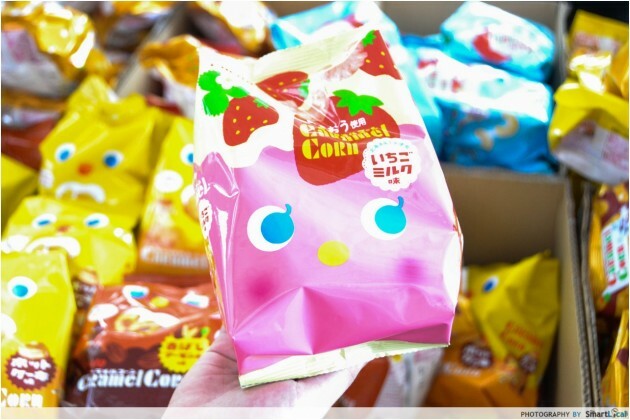 Daisho also offers many Japanese snacks like Tohato Caramel Corn. Many of the flavours I saw aren’t normally available in your typical supermarket. Note: Daisho is only open 3 weeks before Chinese New Year, so you’ll have to look forward to 28 January 2017. Chinese New Year was just over, but who says you can’t throw another steamboat party less than one month after your reunion dinner? 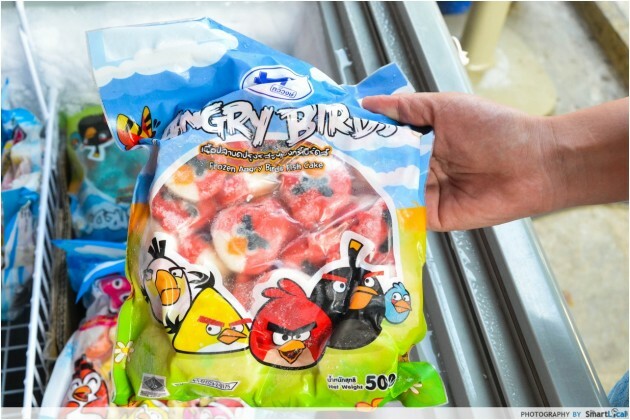 Here’s a hack to help you with that tiresome preparation process - hop over to Li Chuan for some frozen food shopping to secure them springy fishballs, or even cute Angry Birds fishcakes that your guests will be sure to fawn over. P.S: There are never-ending plates of free samples, but you’ll have to go down during the weeks leading up to Chinese New Year to get a taste of them! For all my fellow carnivores out there, Zac Meat and Poultry is where you should go to satisfy them meat cravings. 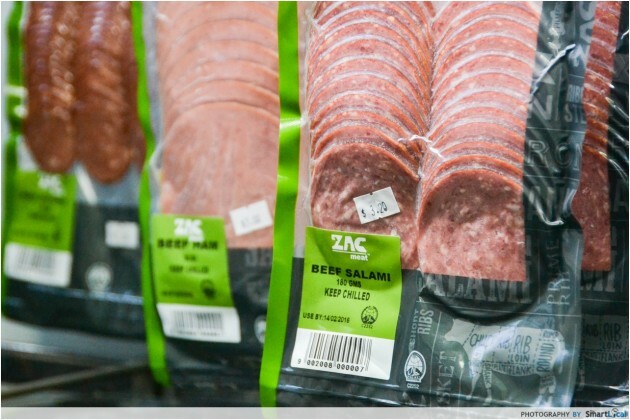 You’ll be able to purchase various cold cuts and sausages here, which are all halal-certified! 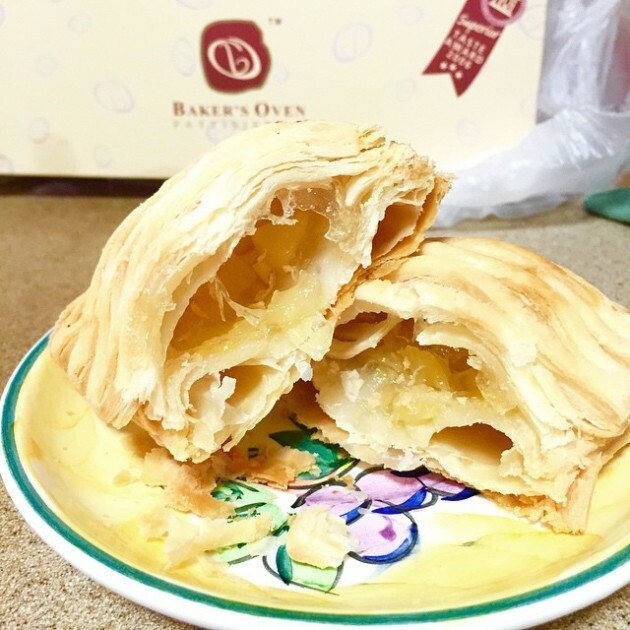 J&C Bakery is no secret to anyone living in Woodlands. 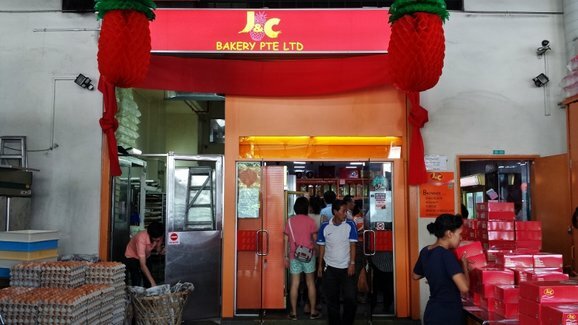 But for the rest of us who don’t know any better, J&C Bakery is known for their brownies, banana cakes, eclairs and durian puffs. A box of 10 mini chocolate eclairs will set you back by $4.80, while a 8” x 8” banana cake goes for $9 - very reasonable indeed. Meng Lee Pao is a dim sum lover’s dream - har gao, siew mai, steamed buns with various fillings such as char siew and red bean, even crispy deep-fried yam rings (it’s sold uncooked though, so you’ll have to do the frying yourself). I think I’ve died and gone to heaven. 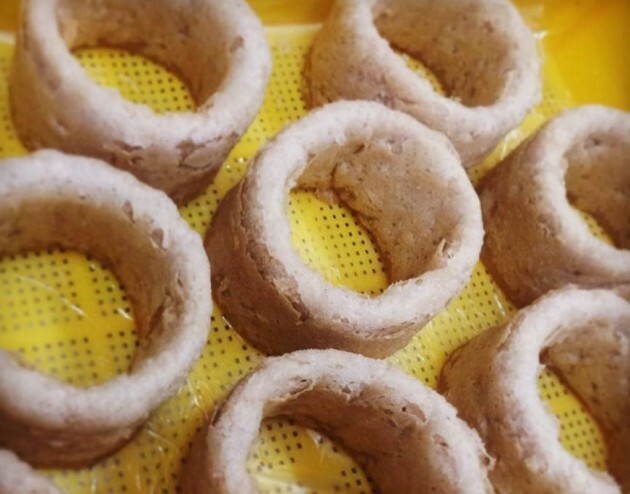 You must be thinking, yet another bakery on this list? But with 54 different puffs and pastries for you to choose from, this is no normal confectionary shop my friends. That’s not all! 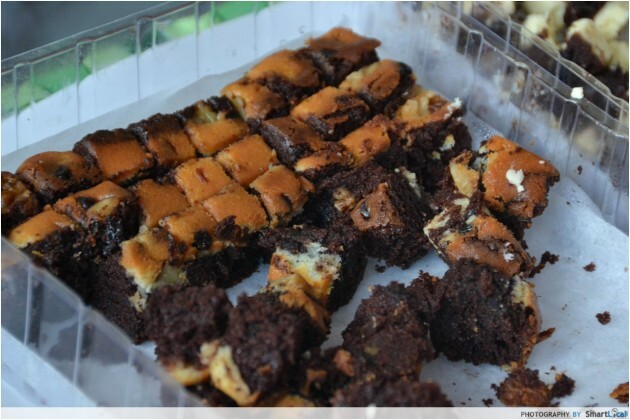 Baker’s Oven also sells freshly-baked cakes, brownies, eclairs, muffins - the list goes on. You’ll be glad to know that Baker’s Oven holds a tasting session every 2nd Saturday of the month, from 9 am - 3 pm. 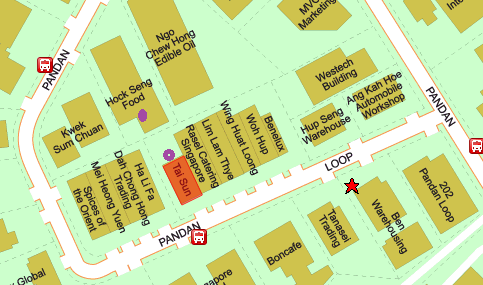 All three stores above are located in Blk 15, in Woodlands East Industrial Estate. 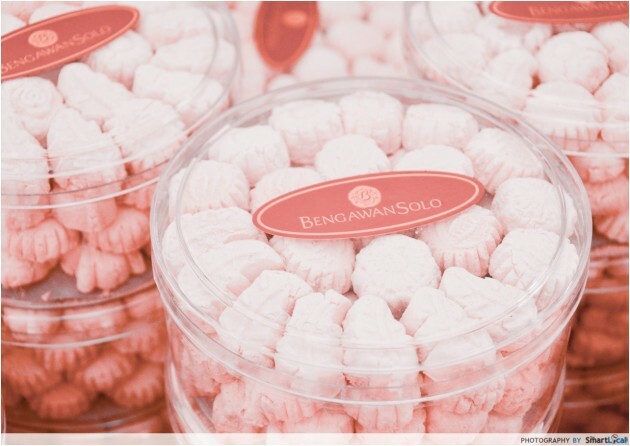 Bengawan Solo goodies for a fraction of the price? Count me in! I visited everyone’s perennial go-to place for nyonya kueh and picked up a few of my favourites. 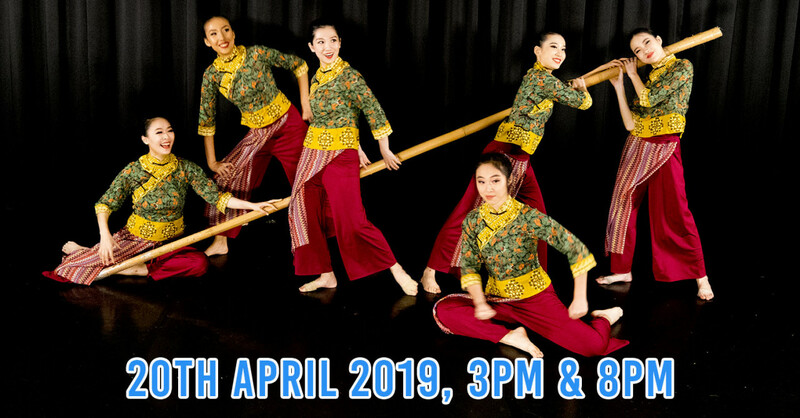 Unlike some other factory outlet sales where the full selection is not offered, or only unwanted goods close to their expiry dates are peddled, Bengawan Solo’s factory discount sale had the entire range. Unless you’re not a fan of Bengawan Solo’s, you won’t be disappointed. 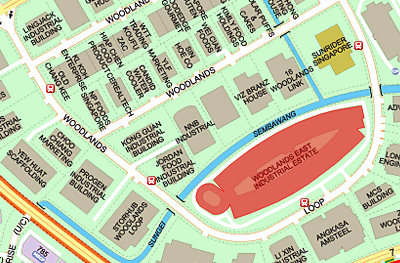 Note: Do keep in mind that I went down to the factories in Woodlands a few weeks before Chinese New Year. 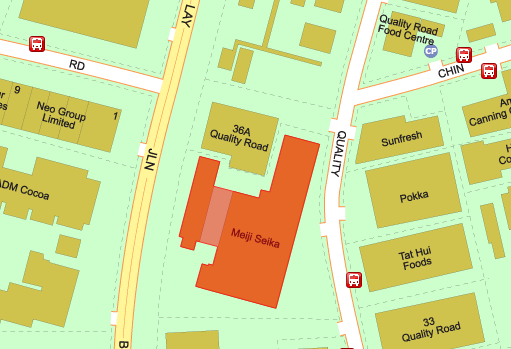 Some of the factories may only be open for special occasions such Chinese New Year and Hari Raya. 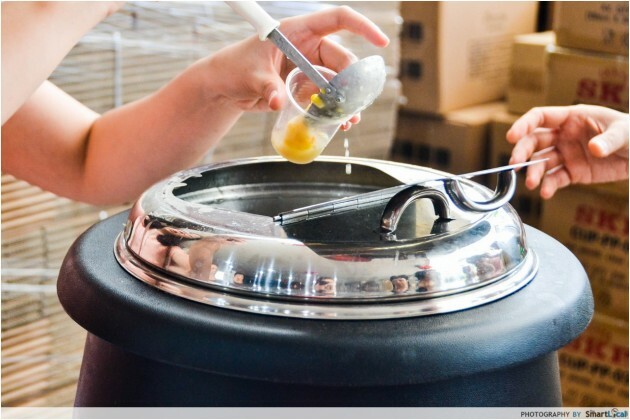 Throughout this article, you may have already noticed that if you go down on a Saturday, many food factories will be holding sampling sessions - essentially a free flow buffet for you to try from. However, steady your heart. Be prepared to push through the crowds and fight the hordes of aunties jostling for the best buy. 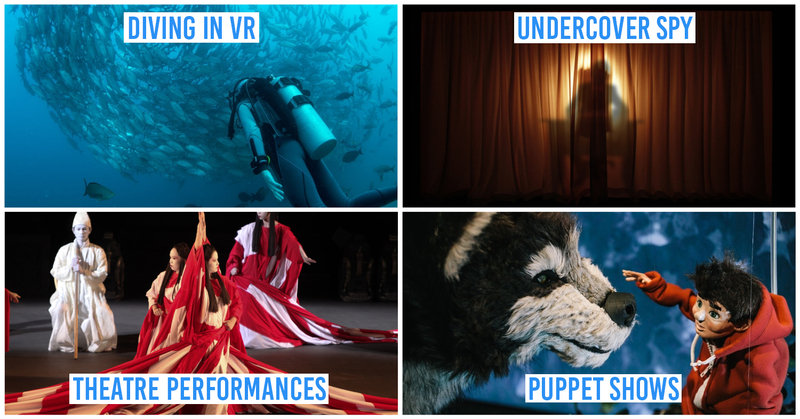 Here is where you can watch Darwinism in action. 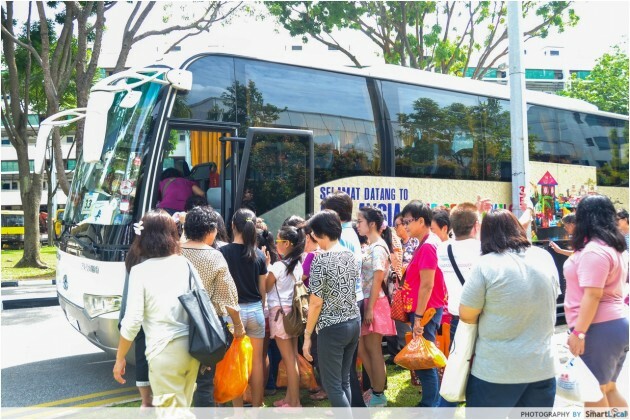 They literally come in busloads, with some even joining tour groups complete with guides to bring them to where the best deals are. This all will be worth it though - cheap prices, fresh produce and free samples, what’s there not to like? 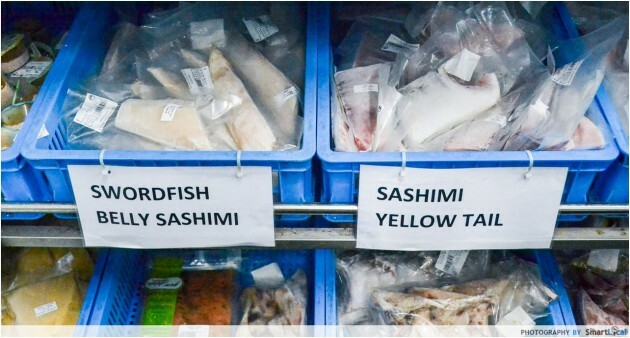 Be a price-savvy Singaporean today and shop at food factories instead of your typical supermarkets. 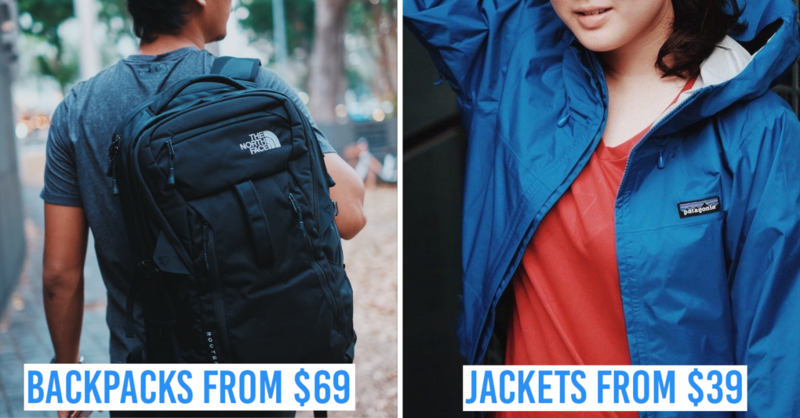 Your wallet will thank you.